Cured Pork Sausage - Chorizo There are 9 products. The cured pork sausage (Chorizo) is a type of cured sausage that is made with minced meat of pork casings and is seasoned with spices, especially paprika and garlic, which gives it a touch of spice and intense red, which distinguishes it from other meats such as sausage. However in the domestic arena you can find three main types, there are many classifications of chorizo: spicy sausage, raw sausage and cure pork sausage for meals. Acorn Cured Pork Sausage Sierra de Tentudia Provenance: Calera de León (Badajoz) Weight: 2.2 lbs (1 kg). Acorn Cured Pork Sausage Sierra de Tentudia. Made with the best raw materials from the best pure Iberian pigs. Raised in the pastures of Extremadura and fed on acorns. 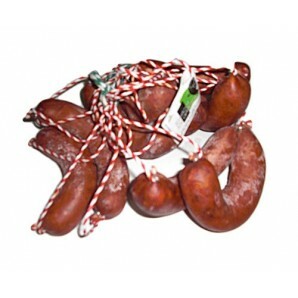 Sausage Iberian with a cure of more than 8 months and selected are at their optimal consumption. 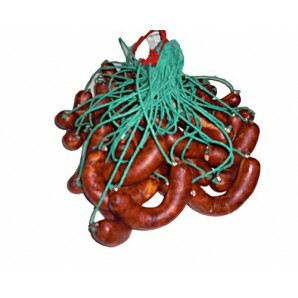 Spicy Cured Sausage from Extremadura Provenance: Dehesa ExtremaduraWeight: 2.2 lbs (1 kg)This chorizo Ibérico is spicy and comes of it saw Extremadura of the manufactures of Hnos. Contreras, has a flavor very genuine and that it makes combine with all. Mainly is used to eat raw but also is ideal for elaborate different dishes of the meal Spanish. White Cured Pork Sausage from Extremadura. Provenance: Dehesa Extremeña Weight: 2.2 lbs ( 1kg ). The White Cured Pork Sausage is one of the products star from Sierra Extremadura. Made from lean of Iberian pigs reared in freedom and a bit of bacon. The white sausage is flavored with salt, spices and garlic. Iberian Spicy Cured Pork Sausage by Herradura Chica Provenance: Calera de León (Badajoz) Weight: 2.20 lbs ( 1kg ) This type of chorizo has a picantito taste very good and from the Extremadura mountains. Comes from the factory of Los Artilleros en Calera de León. This chorizo is ideal for the food, but it can always be used for crude oil by its fantastic flavor. 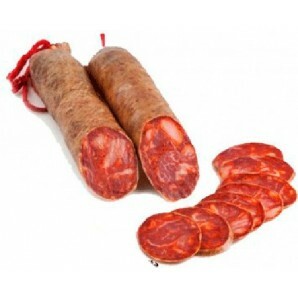 Iberian Sweet Cured Pork Sausage Los Artilleros Provenance: Dehesa Extremeña Peso: 2.2 lbs ( 1kg ) Iberian Sweet Cured Pork Sausage Los Artilleros is a sausage, used mostly to make different dishes and stews in Spanish cuisine. Its flavor is intense and very tasty, a delight for the palate. 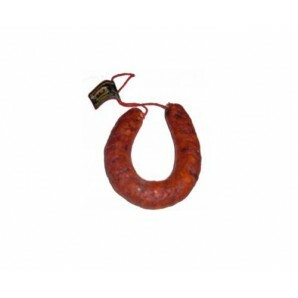 Spicy Cured Pork Sausage Jovira Provenance: Dehesa extremeña Weight: 2.2 lbs ( 1kg ) Spicy Cured Pork Sausage Jovira is characterized by its large size and its powerful flavor. This is a product mainly to eat it raw and barbecues, but also delicious to eat it as a condiment for your meals. Iberian Cured Pork Sausage Herradura Rojo Hnos Contreras. Provenance: Dehesa de Extremadura Weight: 0.66 lbs (300 gramos.) The Iberian Cured Pork Sausage Herradura Rojo is a sausage made by Hermanos Contreras and coming from pigs reared in freedom in the Sierra de Extremadura. This chorizo is made from lean pork meat is stuffed into natural casings of veal and allowed to dry for 15 days. Spicy Cured Iberian Pork Sausage Herradura Provenance: Dehesa de Extremadura. Weight: 0.66 lbs ( 300 grams ) It is obtained from Iberian pigs in freedom in the Sierra de Extremadura. Seasoned with spicy paprika from La Vera, salt, garlic and spices. The paprika gives it a very aromatic and spicy taste. You can eat raw, but it is ideal to make it fried or lentils. Iberian Cured Pork Herradura Blanco Hnos Contreras. Weight: 0.66 lbs ( 300 grams. ) Iberian Cured Pork Herradura Blanco Hnos Contreras. is a sausage made by Ibéricos Contreras from lean pork and a hint of bacon. Iberian chorizo is obtained from pigs fed on acorns in Extremadura and free-range. Its flavoring is based on salt, pepper and spices.